In an effort to extend my fingertip of control, I created a massive 'Before Baby Numero Trois Arrives' list. I even broke it down into tasks to accomplish versus things to purchase. I know, I know; ridiculous. But, it's what makes me feel some semblance of order in a chaotic time. In our best efforts to have a Fall or Winter baby, we landed with a due date smack in the middle of August, creating the perfect storm of activities to surround the arrival of what everyone with 3+ children swears is 'the baby that breaks you'. Awesome. One of the items on that list is 'make and freeze at least 10 meals', and I've never done freezer meals before. This should be fun, right?! Especially since we didn't actually have said freezer. From the time we moved into our house, we've been talking about getting a TuffShed for the side-yard to put the lawn mower and other outdoor items that have taken up residence in the second car portion of our garage. Getting said shed would free up wall space to get a freezer for the garage so we can take better advantage of our Costco membership. I love the french door/bottom drawer freezer combo we have in the kitchen, but it's not a great load-'er-up freezer. I had already thought about making some meals ahead of time, but she provided the motivation to actually create a plan even though we didn't get to make them together. My neighbor was a big cheerleader on the freezer front because she successfully wrangles four boys ranging in age from Kindergarten to Junior High and has homemade meals on the table even in the midst of multiple sports practices and other obligations. Give yourself three days; one day to find all the recipes and make a master grocery list of everything you need to complete all of the recipes and cross-referencing it with what you have on-hand versus what you need to purchase, one day to shop for, and organize, said supplies (including everything you'll need to actually package it for the freezer) and create a battle plan for the actual day of cooking. Lastly, you'll need one full day to spend slaving at the stove at the end of which you will smell only marginally better than those sweaty summers you spent cooking in a Mexican Health Food Restaurant that did not have air conditioning. No, it wasn't pretty. Plan this around a birthday or other major holiday so that your boys are stoked to spend a lot of unattended time with new lego sets or, if you're lucky/planful enough, when you have someone to take your kids for the day or a spouse who's not working. I didn't have either, so Legos it was. Have something to motivate yourself with at the end of the day, even if you will be too tired to use it. Did I have the energy to drag my booty to the salon for the pedicure I promised myself? Hells no. But I did make my husband rub my feet after I showered and collapsed on the couch in the evening. The rest is just physically doing the work; chop, sautee, brown, drain, combine, package, freeze. Chop, sautee, add liquid, bring to boil, reduce to simmer, package, freeze. Repeat according to the number of recipes. My battle plan included creating an order of recipes so that I was efficient as possible, pooling ingredients, poaching all of the chicken breasts I needed for 4,762 cups of diced cooked chicken, etc and it was still a very full day in the kitchen. I completed ten separate recipes (not including the muffins) on the big day of cooking yesterday, then made a batch of meatballs (4 pounds of ground turkey's worth) tonight after a massive Costco haul, when I realized that if I didn't make them, I would not have room for the four cartons of orange juice and 900 containers of yogurt that I'd brought home. My freezer makes me happy when I open it and I can now work on the 'make one, freeze one' philosophy to keep things going. I noticed in the midst of browning my eightieth pound of ground beef yesterday that I didn't have any vegetarian meals on my list for the day, which was surprising because we eat a lot of meatless meals. I think that this is partly because a) the veggie meals seem to be the ones that are easiest for me to throw together with the least amount of prep and b) I just didn't think about it, and will be able to remedy this as I double up meals in the future-such as the Butternut Squash Enchiladas with Peanut Sauce that I love. I did, however, try to be as healthy as you can be when putting together a bunch of comfort meals to reheat at a later date. I didn't use a single can of 'cream of (fill in the blank)' soup, I tried to use organic and low sodium seasonings and stocks when available and I used organic meat, which may be a small consolation as my family is shoveling the 900th meal into their faces that is based on ground beef. Oh well. They will be fed, and it won't be McDonald's. I'm calling this a win. 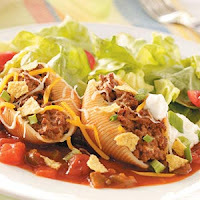 Here's what I ended up with, by using just two sources (save one recipe); the Our Best Bites Freezer Meals Mini Cookbook (free download for Mac or PC here) and the Taste of Home Freezer Meals, which caught my eye in the check-out line last week. And here's what it looks like, when you add in the Costco bread, muffins, eggo waffles, dino nuggets (my first time purchasing chicken nuggets for the boys in over a year) and extra butter and cheese. I also made labels for each item with instructions on re-heating, because there is no way I'll remember everything I was supposed to put with each meal, or how to not give my family food poisoning in doing so. If there was a time limit for use indicated, I added that to the label as well. 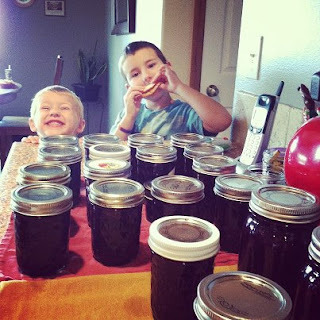 Oh, did I mention I also made a years' supply of jam on the morning of Day 2? Can you tell that I'm terrified to stop moving lest I have to actually think about the process of a drug-free labor? If you're interested in starting a stock of freezer meals, or have any questions, I'd love to offer whatever advice I have, although it will be quite limited. Pinterest is also full of great ideas, and there are tons of blogs dedicated to freezer meals in general and crock-pot freezer meals specifically. It's definitely daunting, but I'm sure I'll appreciate it when I have evenings and afternoons freed up (or free to go to soccer practice at least) in those first few months of adjusting to being a mama of three. Now to just stave off labor at least until tomorrow is over, because my boys have earned a day of simple fun, without an errand or dismissal in sight! I'm so inspired by you! We've had the "let's get a freezer for the basement" talk a few times to stretch the BJ's membership but it hasn't yet come to fruition. And freezer dinners sound a lot better than the "What do you want, I dunno, what do YOU want?" dinner game. We write a menu two weeks in advance but that's the only planning I've done so far. WOW!! You amaze me. Seriously. You are going to love this in the coming months, when you have three kiddos to contend with and at least you won't have to stress about what's for dinner. Way to go! I love the thought of a stocked freezer. Perhaps I just need to be pregnant to get motivated. Good luck, 3 is easy. I love this post! I will be using it as reference :).